This often quoted phrase is a bit of an addicts mantra; and as such has been very over used. I’ve got this on my sobriety pendant – but I have very mixed feelings about this innocuous little maxim. It saved me, I know, not looking too far ahead. The anxiety at having to cope with Christmas sober for example , freaked me out so much, if I had looked at it, I think I would have caved in right then. So I grimly refused to think about anything further than 24 hours ahead and navigated the initial acute withdrawal and the persistent, intrusive thoughts about alcohol, by coping in the minute. As the days turned to weeks and the occasions I had been so afraid if passed despite me not drinking, (-and oddly seemed to be better sober) I still found myself unable to picture myself long term sober .. 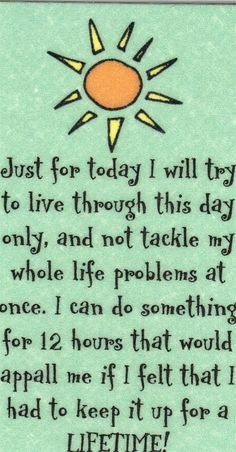 So I kept on with the “one day at a time” and that was ok – until it wasn’t. It took me 22 months to get sober again. And again, this time I started, 132 days ago, by taking each small chunk of time and planning to say sober in the minute. But I think to achieve long term sobriety you have to let go of that at some point. I genuinely feel I am now able to do that. I do not consider drinking again to be an option for me, no matter what situation I find myself in. I can’t envisage any circumstance that would be improved by my drinking alcohol, and so, whilst I still plan, I don’t any longer feel I am lurching unsteadily from one fragile sober day to the next. This entry was posted in alcohol and tagged aa, One day at a time, recovery. Bookmark the permalink. That’s a very good point. I think we do enter dangerous territory once we start thinking “we will never drink again” because we can never know that – and that’s the start of the drift into relapse. But at some stage, years perhaps, (and I don’t speak on authority here) it must just come very easily to those people, and they still say “I’ll keep it in the day” thing despite having gone well beyond that and it’s just they feel they should say it, for newcomers or whatever. It’s an AA mantra I guess. Helps though when struggling with cravings. Good thinking here, Batgirl…. I like ‘keep it in the day’ too. Another way of looking at it could be ‘doing today’s work today’ – an analogy that worked well for me in the early days was imagining if I had to do all the food shopping and storing cooking for all my future meals – even for a year’s future meals – all today. It would be impossible! There wouldn’t be room in the fridge, or enough cooking utensils, and not enough time in the day of course to do it all! We are not called to meet all future challenges in this current instant – just those that pertain to this moment. I agree with you about the negative part in thinking that it will always be a struggle. I have to believe that it won’t be. I also have a hard time with the premise that “you are powerless over alcohol”. I think putting down the booze is a VERY powerful step! And, everyday has its challenges-that’s life. It’s just that drinking adds to them in the long run. I can’t– at this early point in my sobriety — grasp the concept of “never again”. I’m struggling with the thought of sober vacations and getting through holidays and concerts and weddings…. But honestly, I can’t let myself go there right now. The “deal with it in the moment” mantra is the only thing I can comprehend at this stage. But I totally agree that it can’t always be that way. At some point, we just have to move on and accept the new way of life. For example, I used to be a smoker. I quit more than 10 years ago and honestly, I have a hard time remembering what it was even like to be a smoker or that I was indeed a very heavy smoker. Quitting wasn’t easy and it took me a ton of times to finally get past it. But now, I wouldn’t even consider picking up a cigarette. I hope it’s like that with drinking as well. Eventually, you’d think that something has to click in our heads and say “no, that’s not me, I don’t drink” and it will feel as natural as breathing. 132 days is amazing! Go you! I too look forward to the day where “I don’t drink” feels good and is easy to say.